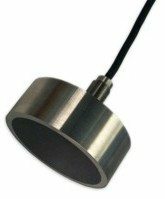 Custom Acoustic Transducers | Sensor Technology Ltd. Custom Acoustic Transducers | Sensor Technology Ltd.
ultrasonic flow measurement and more. 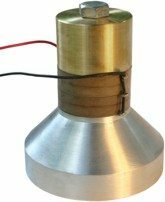 This web site provides some examples of our acoustic and ultrasonic transducer designs. Contact us to discuss the specific requirements of your application. We work with our customers through the entire product development process, from prototyping to production. During the design phase was have the ability to create 3D models and perform beam modeling and finite element analysis. More importantly, because we manufacture our own piezoelectric ceramics, our engineers have the materials at hand to build test units. 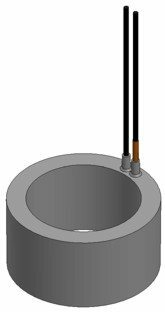 We can quickly validate design concepts on actual transducer sub-assemblies. From piezoelectric ceramic processing and sensor assembly, to electronics integration and testing, all build stages occur at one facility. Our vertical integration provides you with fully optimized product designs, end-to-end quality assurance and greater control over delivery scheduling. Piezocomposites have several advantages. They lower the Q of a transducer, improving the broadband response. They also provide good coupling in the thickness mode (k33). Further, piezocomposites reduce sidelobes inherently. Hard shading— wiring the ceramic so the pillars on the periphery are exposed to a lower voltage —reduces sidelobes even more. With low levels of cross-coupling, 1-3 composites are also commonly used for applications that require an independent response from each pillar for the purposes of beam focusing and scanning. These include phased array ultrasound transducers for NDT and medical imaging, as well as advanced underwater imaging applications such as mine hunting. A mass loaded element is a simple, three component assembly. It has a head mass, a piezoelectric disc and a tail mass, all bonded together. This assembly provides two principle advantages over monolithic ceramics. First, the head mass, tail mass and piezoelectric ceramic all resonate together as a single unit. So, the mass loaded element resonates at a lower frequency than just the ceramic itself. Attaining lower frequencies with piezoelectric devices can be a challenge and this approach provides a simple solution. Second, the materials selected for the head and tail masses improve the output. The head mass material transmits acoustic energy efficiently. The tail mass provides a good backing layer. This reduces losses out the back while sending more energy out the radiating face. Mass loaded elements produce compact, lower frequency devices and increase acoustic output in a cost effective manner. The Langevin is similar to the mass loaded element but with two important differences, both lending to an increase in acoustic energy output. First, unlike the mass loaded element, the components are not bonded together. Instead, a bolt running through the length of the assembly fixes the components together. The piezoelectric ceramics are washers, not discs, to allow the “bias bolt” to pass through. The bolt creates a compressive pre-stress on the ceramics. (A mass loaded assembly does not have a pre-stress.) As a result, the Langevin can endure a higher driving voltage. Langevins often stack several ceramics together. The total displacement is cumulative. The more ceramics in the stack, the greater the displacement of the head mass. In other words, the greater the amplitude of the acoustic output. Accordingly, Langevins have a high power output, making them ideal for applications such as sonar array transducers, ultrasonic cleaning and ultrasonic welding.